We had a long week stuck inside, as I'm sure you have heard, we had a Polar Vortex hit Chicago, making the temps brutal, it got as low as -55 one day, making it ALMOST the coldest day in the history of Chicago, brrrr! 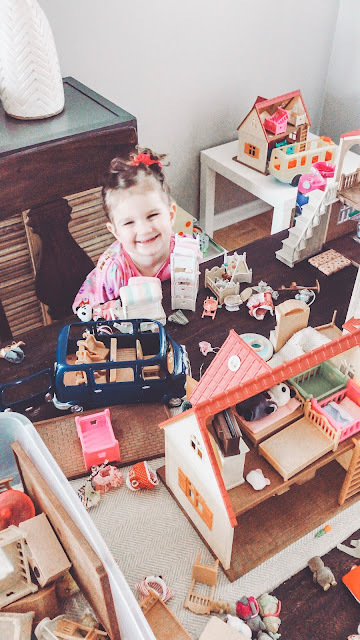 My little ladies did a great job keeping busy, we played endless hours of Calico Critters, Bake Shop and "family," which I love hearing them play, Avery is always the Mom and Emmy is the baby, it's adorable! Ok and I just had to share this Instagram vs. Reality moment at our house, I just want to keep it real and let you know, this room typically looks like the second photo majority of the time. However, I can not sit down and relax at the end of the day if this room is not picked up! This weekend I am in total party planning mode! Our sweet Isla Rose is turning one on the eleventh and Mama needs to wrap up ALL her party details. With all of our sick days and snow/cold days, this party has snuck up on me. But, to be totally honest, I'm looking forward to spending my Saturday out of the house, running errands, we have all been stuck inside for too long! I'm planning on writing a longer post with ALL of the party details, but here are some of the plans that I have already taken care of. I have always found that if I pick a theme that is also seasonal around the time of my little ladies birthdays, I can find really great and inexpensive decor, especially in the Target dollar section! For Isla's party, I scooped up ALL the Valentine's decor I could find and the best part is, we can reuse these decorations for Valentine's Day in the years to come! Here are some of the "pins" that inspired me for Isla's birthday, you can also check-out the board here: First Birthday Ideas. I'm keeping the menu pretty #basic, I love breakfast food and it's super easy to plan for! I'm planning on serving: bagels with cream cheese, sausage, egg and cheese casserole, yogurt parfaits, donuts, fruit skewers and some yummy snacks too! For dessert I'm attempting to DIY a donut wall, fingers crossed I can make it work, I think it would be so fun to use for future parties too! I always rely on Etsy to find a cute first birthday party outfit for my little ladies, I love keeping the outfit in their memory box! 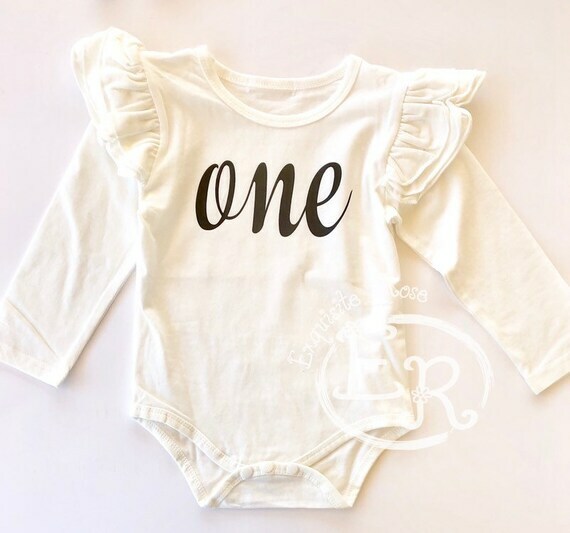 There were SO many donut themed outfits, it was actually hard to pick, but I couldn't resist the cute ruffle on this onesie from the shop: Exquisite Rose. I can't wait to get it in the mail! 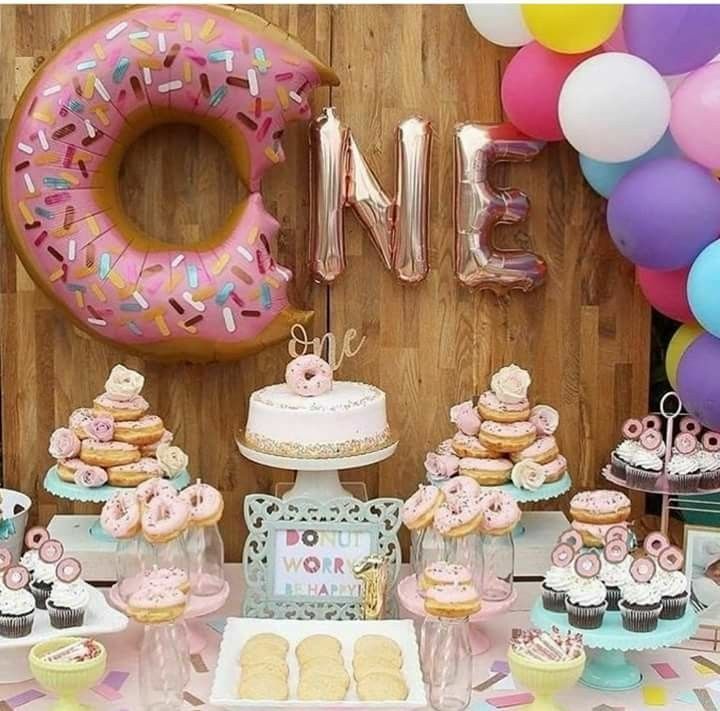 Pinterest was my savior when it came to planning this party, the donut theme is VERY popular right now, which also made decor ideas really easy to find and pretty cheap too. I grabbed some printables off of Etsy form the shop: Design My Party Studio and will be busy cutting this weekend! 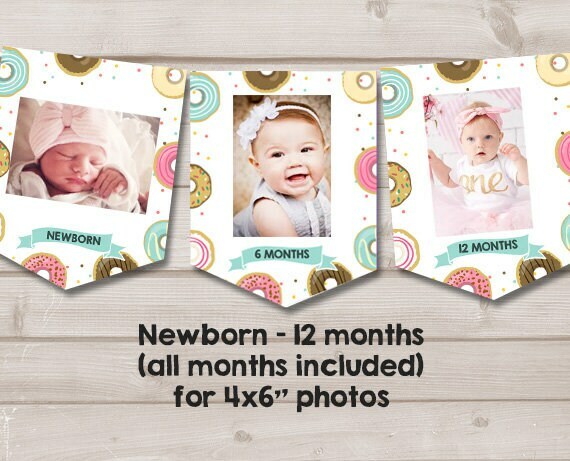 I love making the monthly banner for first birthday parties, it's so fun to see how the girls changed from one to twelve months. I also found the CUTEST balloon shop on Etsy: Cher Can Do It, you have to go take a peek, everything is really reasonably priced and she even offers balloon garland kits! Last but not least, I'm rounding up some of our favorite gifts to give when we attend a first birthday party! After three little ladies, I feel like I have a good grasp on the toys that they keep coming back to play with. While the kiddos love opening up a new toy or two, we also love when the Grandparents treat us to our Zoo pass, or even give us money towards an activity like swim lessons! What's your go to first birthday gift? I hope you all have a wonderful weekend, let me know your plans and if you're from the Friday Favorites link-up, make sure you leave a link to your post, I would love to see what your favorites are too. Stay warm and if you want to keep up with more of our daily adventures, follow the little ladies and I on Instagram: @snyderfamilyco. I'm so excited with how it's all coming together, ordered all the last minute things I forgot on Amazon yesterday, thank goodness for Prime! Happy Weekend! 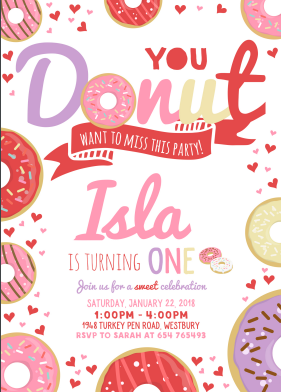 I love the party theme you picked for Isla's birthday! Thanks Angela! 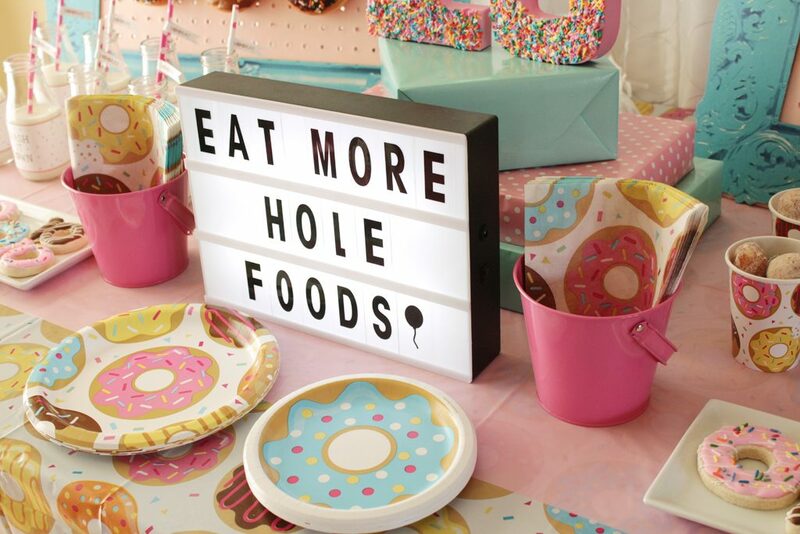 It is such a fun theme to shop for and our donut wall turned out so great, can't wait to share pictures from the party! Oh my goodness! I love your blog! I'm over here in Michigan and yes - that weather was something else, eh!? Soooooo cold! I adore your real life picture...oh man - it sure does make me feel normal! 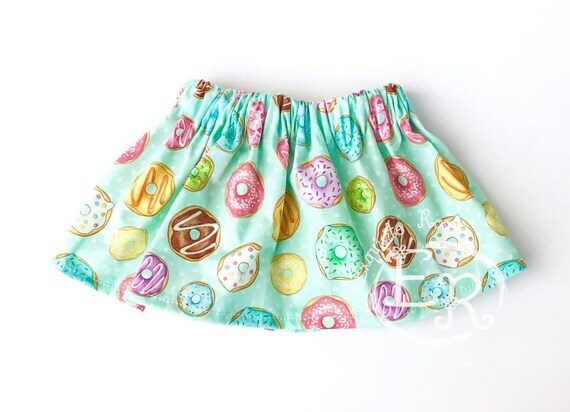 I'm loving all of your doughnut party supplies! Gah! So cute! Another midwest Mama, I love it! I'm so glad you appreciated that real life photo, it's pretty much what my house looks like as long as all three little ladies are awake! 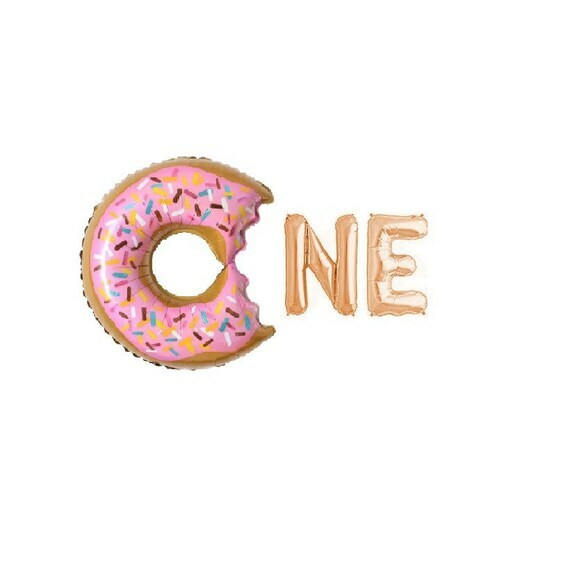 The donut theme was SO fun to shop for, wait until you see our donut wall, so fun and easy, hope you're having a great week! I love your first birthday party theme. So cute. I also love the IG vs reality. I love seeing how things really are. Makes me feel better about my life too. We all live in chaos at times! Right! One of my girlfriends always says, "We are all a hot mess, some people just hide it better then others!" And it's just so true, sending you a virtual coffee cheers! So happy to be linking up with you all, very thankful to be included! We have ANOTHER day off of school tomorrow, we are experiencing "thunder-ice"!? Who knew that was a thing, all I know is, the little ladies and I are SO ready for spring weather!